Ana: I wonder: when did I cross that line where picking up a horror book about a ghost with a bloody character on the cover became such an easy thing for me to do given how the combination of these three things should have put me off completely being the scaredy cat that I am? Psychological musings aside, Anna Dressed in Blood is a mixture of Supernatural (reminded me of their earlier episodes, when the show was still good), Buffy the Vampire Slayer and Ghostbusters (with inside jokes and everything) with extremely gory scenes, plenty of scary moments and a group of cool central characters. Despite a couple of minor criticisms, Anna Dressed in Blood was a super fun book to read and I ended up loving it. Thea: First, let me say how proud I am that Ana has put aside her qualms and has fully embraced the awesomeness of horror/ghosts/blood and all these books entail. My work here is truly done. Second, as to this book in particular, I fell in love with the cover instantly and pined for this book for a good long while. And you know what? It’s a solid, entertaining read. There’s nothing really novel or mindblowing about Anna Dressed In Blood, but if you’re in the mood for a nice haunted house/YA urban fantasy type title (with the requisite dash of romance), you can’t go wrong with Anna. Ana: Theseus Cassio Lowood, otherwise known as Cas, is a 17 year-old lone Ghost hunter, following in the footsteps of his late father. For the past 3 years, Cas’ life has been all about tracking down and killing (again) murderous ghosts with the help of his athame, a ceremonial dagger passed down the Lowood bloodline. His most recent case brings him to Thunder Bay, Ontario where “Anna Dressed in Blood”, the ghost of a teenage girl who was murdered back in the 50s, has been killing those who dare enter her house. When Cas’ first encounter with Anna ends up in bloodshed but when he is miraculously spared, he realises something is afoot and with the help with a couple of local kids, he sets out to investigate the truth behind the legend of Anna Dressed in Blood. I thought Anna Dressed in Blood to be a great combination of a plot-driven and a character-driven story. The plot is divided in two main threads: the immediate mystery of Anan Dressed in Blood and the investigating that Cas has to do in order to kill her; and then there is Cas’ overarching character development: from having to follow on his father’s footsteps believing they are the only ones with the power to dispatch the ghosts and all the choices he has to make in order to carry on doing just that to preparing himself to face his father’s murderer – a dangerous ghost truly out of nightmares. The most interesting thing is how, his meeting Anna is the catalyst that will combine both threads and I thought that was done really well. The idea of a ghost killer who kills only killer ghosts – Cas is almost a lighter version of Dexter – is great as is Cas’ narrative voice. He can be funny and charming but also an extreme douchebag (but more on that later). I also loved how the author managed to add a definite touch of Southern Gothic to a novel set in Canada and the darker tone of the novel when it came to the murders (some of the ghosts are extremely vicious, including Anna) and I thought that each ghost was created with aplomb: form their motivations to their physical descriptions. On the down side, I was somewhat disappointed with the denouement of the Anna-related plotline. Without spoiling too much, I was hoping for something more creative and edgy than what we’ve got. Although I eventually got on board of the Anna-train because she is a fabulous character with a sad, terrifying back story. Another criticism I have comes from noticing how the characters’ reactions to the gory and extremely dangerous events seemed off somehow: people disappear and die and it’s like no one really cares. Even though there is an “explanation” as to why people don’t investigate murders committed by ghosts in this world, said explanation was not entirely convincing especially when it came to how people reacted: there was not enough fear, distress or grief in face of the terrible things that happened in the book, sometimes in front of their very eyes. This story is billed as a horror-meets-romance and although the romance never takes over completely, it is definitely there and I saw it coming from the get go. Although I completely understand the characters’ motivation and attraction, it is not a romance I can ever support so maybe it is why I liked it so much because I feel it is doomed to fail (as another aside: when was it that I started to hope for romances to FAIL?). Having said that, I feel that all the aforementioned criticisms stem from having enjoyed this book so much – it means that I wanted for more and from what I’ve seen thus far, I know that the author can deliver. So here is hoping that the next book will have fewer stumbling points and that some of the plot points are developed in-depth the sequel: there are many, many tasty morsels left open for future entries. Thea: I both agree and disagree with Ana. I agree that the setting of the book – as incongruous and strange as a haunted house/ghost story in Ontario seems – is fabulous, and I love the development of the characters (especially Cas) and the gradual reveals of Anna’s past, why she’s such a vicious ghost, and Cas’s family legacy, especially as it pertains to ghost killing and the powerful relic that is the athame. I liked that Cass is kind of douchey, and that there is a lot of growth for his character (but more on that later). I also appreciated the different types of magic, belief systems (including Voodoo! ), and types of ghosts themselves that are incorporated expertly in this world. That said, I do have some sizable reservations. I want my ghosts to be scary. I want Anna dressed in white and red to be the terrifying hell-goddess, capable of eviscerating mortals with a thought and a cold caress. I want TERROR. There was so much potential for Anna’s character, but I really, really did not like where this novel took her (hint: it’s romancey). Her backstory, and to some extent the entire book, felt a little banal – a little, “so what”? Which sounds horrible and jaded, but I can’t help but wish there was a little more oomf, more originality in terms of backstory and plot. That said, Ana makes a good point, and perhaps the reason I’m frustrated is because there IS a lot of awesome potential here. And that makes me excited for the next book. Ana: It took me a while to warm up to Cas. Even though his voice was a great leading voice for this book, as a character he starts off as a bit of a douchebag especially when it comes to treating people and how he feels about his place in the world as he is the Only One and therefore Special and although he is somewhat a reluctant hero there is no denying that part of him relishes this power. However it soon becomes clear that this is all part of his character’s arc and growth: from realising that he can actually have friends and he doesn’t have to use them and leave them; to the growing suspicion that the source of his power might not be benign or exclusive. I believe this is probably the point of the series and the most fascinating and engaging aspect of it for me. As for Anna, part of me loves her darker (whoa, she was SCARY) side way more than the lighter side but I loved her sad story and I sympathised with her plight and I hope we can see a lot more from her. I also really loved this world’s version of the Scooby Gang, Cas’ two new friends, Carmel and Thomas. At first it seemed they were stock secondary characters but as the story progressed they were further developed and I loved the group dynamics and I think this has a lot of potential. Also: Carmel and Thomas are the OTP of this series. Thea: I actually really liked Cas from the get-go, probably BECAUSE of all the reasons Ana mentions. He’s kind of a jerk, he’s got a superiority complex, and everything just comes so EASILY to him it’s kind of sickening. But that’s what makes him so realistic and his arc so compelling – because he is this baby egotistical dude with a faux hero complex, and we see him grow so much over the course of the book. I loved his wry asides and his swagger because of this. Of course, then there’s Anna, who is a wonderful visual character with a nasty past. I agree with Anna in that I LOVED her dark side and wasn’t a fan of her “nice” side. I can’t help but feel that had Anna remained the villain of this piece, the book would have been far more interesting… but that’s just personal opinion. As far as other characters go, I really appreciated the family dynamic between Cas, his mother, the memories of his father, and the overseas/Giles/Van Helsing figure of Gideon. In many ways, Anna Dressed In Blood is kind of like a riff on Buffy (where Thomas is kinda Willow/Xander, Carmel is Cordelia, and so on). 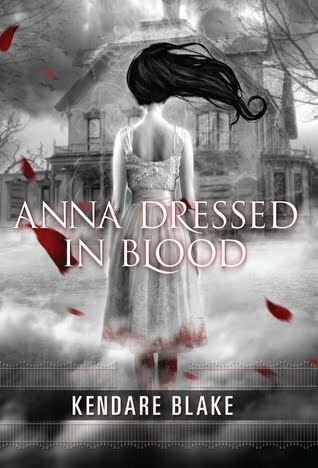 Ana: Despite my criticisms I truly did love Anna Dressed in Blood and it is definitely a notable read of 2011 for me. I can’t wait for more. Thea: I enjoyed the book too, although I do have some sizable reservations. I have high hopes for the next book and will certainly stick around for it though! The grease-slicked hair is a dead giveaway—no pun intended. So is the loose and faded leather coat, though not as much that as the sideburns. And the way he keeps nodding and flicking his Zippo open and closed in rhythm with his head. He belongs in a chorus line of dancing Jets and Sharks. Then again, I have an eye for these things. I know what to look for, because I’ve seen just about every variety of spook and spectre you can imagine. The hitchhiker haunts a stretch of winding North Carolina road, bordered by unpainted split-rail fences and a whole lot of nothing. Unsuspecting drivers probably pick him up out of boredom, thinking he’s just some college kid who reads too much Kerouac. “My gal, she’s waiting for me,” he says now in an excited voice, like he’s going to see her the minute we crest the next hill. He taps the lighter hard on the dash, twice, and I glance over to make sure he hasn’t left a ding in the panel. This isn’t my car. And I’ve suffered through eight weeks of lawn work for Mr. Dean, the retired army colonel who lives down the block, just so I could borrow it. For a seventy year old man he’s got the straightest back I’ve ever seen. If I had more time, I could’ve spent a summer listening to interesting stories about Vietnam. Instead I cleared shrubs and tilled an eight by ten plot for new rosebushes while he watched me with a surly eye, making sure his baby would be safe with this seventeen year old kid in an old Rolling Stones t-shirt and his mother’s gardening gloves. To tell the truth, knowing what I was going to use the car for, I felt a little guilty. It’s a dusk blue 1969 Camaro Rally Sport, mint condition. Drives smooth as silk and growls around curves. I can’t believe he let me take it, yard work or no. But thank god he did, because without it I would have been sunk. It was something the hitchhiker would go for—something worth the trouble of crawling out of the ground. “She must be pretty nice,” I say without much interest. “Yeah, man, yeah,” he says and, for the hundredth time since I picked him up five miles ago, I wonder how anyone could possibly not know that he’s dead. He sounds like a James Dean movie. And then there’s the smell. Not quite rotten but definitely mossy, hanging around him like a fog. How has anyone mistaken him for the living? How has anyone kept him in the car for the ten miles it takes to get to the Lowren’s Bridge, where he inevitably grabs the wheel and takes both car and driver into the river? Most likely they were creeped out by his dress and his voice, and by the smell of bones, that smell they seem to know even though they’ve probably never smelled it. But by then it’s always too late. They’d made the decision to pick up a hitchhiker, and they weren’t about to let themselves be scared into going back on it. They rationalized their fears away. People shouldn’t do that. Romancey? They take that awesome cover and that intriguing blurb and go with a YA paranormal romance?! Ugh. This book just fell to the bottom of my TBR pile. So I’ve seen a few folks gush about this book on Twitter, and I’ve failed to see why I should read it. 140 characters of OMG READ THIS BOOK NOW IT’S AMAAAAZING means nothing to me. (I need a little more, you know?) And then I read your review. Ana, you and I are like twinkies when it comes to being scaredy pants. I haven’t read any horror since elementary school (I was a twisted kid, y’all), and this year I’ve eased into The Walking Dead (which I love because of the characters), but for some reason even THINKING about reading scary stuff made me feel ansty. @ draconismoi: Wait, don’t give up on this! This is not your regular PNR YA, it does feature a romance but it not overwhelming nor does it rule the story. @ capillya: yay!! I hope you enjoy it as much as I do! Let us know if you end up reading it! Just read this and loved it. The romance was secondary to the horror, which I liked. I think there are several unanswered questions about Anna. It seemed almost too easy, the explanation of her death and why she, as a ghost, was different. I understand there’s a second book planned, and I’m hoping some of that gets addressed.